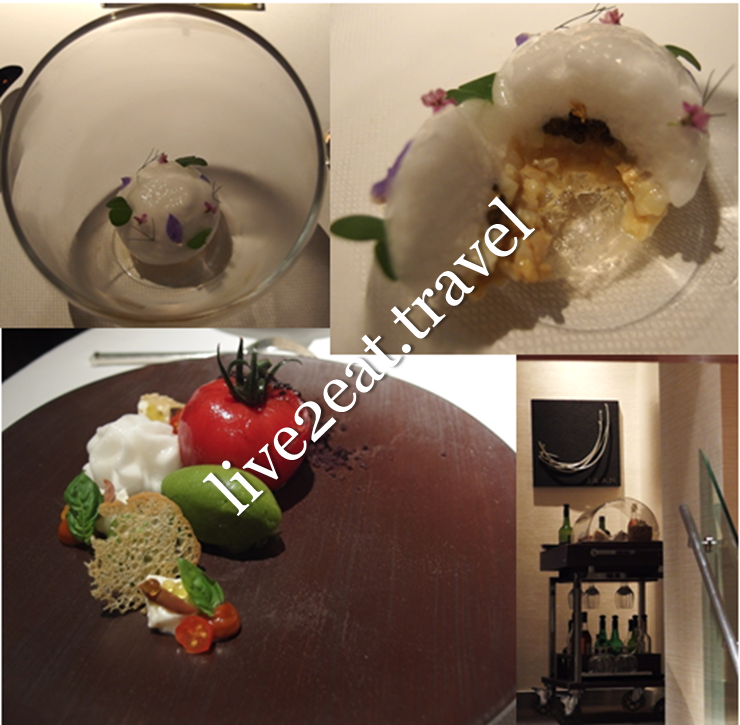 Upon hearing that Jaan was awarded one Michelin star in the inaugural edition of Michelin Guide Singapore last month, was hoping very hard that I still have a chance to try (have wanted to for the longest time but never got down to doing so). Located on the 70th floor of Swissotel the Stamford, Jaan is derived from the ancient Sanskrit word for "bowl". As my dining companion made a reservation more than two months in advance, we were seated at a table by the window. It was a weekday night and according to the website, "only 7 and 10 course menus will be available during dinner service". We settled for the former, choosing Menu Prestige over Jardin Gourmand (vegetarian) and neither topped up for the finest cheese selection and condiments nor wine pairing. While all guests at the table are expected to order the same menu, dishes can be modified or replaced according to different guests' dietary requirements. 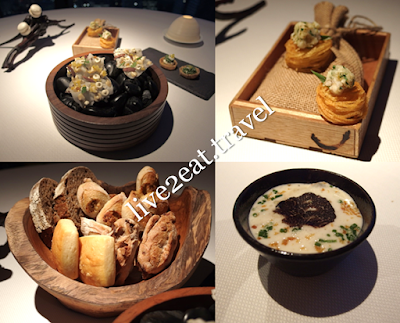 Started with complimentary appetisers, amuse bouche and four types of warm bread. Foie gras macaroons perched on a "tree trunk" were sweet and savoury at the same time while fish and chip presented as canapé – non-deep-fried fish atop deep-fried potato, was lovely. Oh, and see the truffle in the amuse bouche! No complaints about the fluffy breads served with salted and unsalted butter for my dining companion, olive oil and vinaigrette for me. Could neither rave about the first course of Dressed Crab with caviar and gold foil nor fault the second Heirloom Tomato that was sweet yet tangy and every element on the plate came well together. My favourite was the third course of Soft Organic Hen's Egg with artichoke and chorizo iberico. The eggs were prettily presented in a basket and its content poured over a bowl. A perfect balance of taste and texture though I could not smell the aroma of the rosemary below the bowl. Next was Hand Dived Scallop with cabbage and pine dashi, followed by Line Caught Snapper with trumbetta zucchini. Fresh and succulent seafood accentuated by the accompaniments. Sixth course of "Forest" Pigeon with white polenta and cromesquis did not impress. Before the last course of Ivory Caramel, a refreshing palate cleanser was served. Loved the popping chocolate and hazelnuts in the dessert of textured chocolate but found the mousse too cloying to finish. Then, it was time for Café Express (choice of coffee or tea) and petite four. I had espresso while my dining companion drank tea. They were served with milk, brown and white sugar cubes. And all sat in clear containers on a tray, reminding me of science experiments in the laboratory. 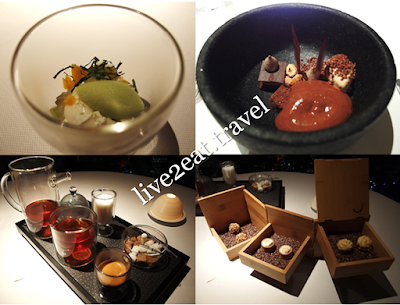 Delicate petit fours were presented in a wooden box that swung open to reveal three layers, each with two pieces of the same kind sitting on chocolate shavings – an appropriate end to a yummy meal and pleasant experience at the French restaurant.